← Saturday 11th April 2015 – Mushrooms and stuff!! Sunday 12th April 2015 – Polesden Lacey. As it was such a beautiful day and so we decided that we’d got out for the day. Mark said he’d buy us all lunch as we’d worked so hard for the last couple of weeks. We didn’t want to drive too far, so opted for Polesden Lacey. We’ve all been here before, but Mark had never been in the house before. I think the last time he came with us it was February and the house was closed. So today he got to go inside. As we wandered through the rooms and looked at the wonderful views over the Surrey Hills, it made us all very jealous. We were dreaming of our ideal house and garden, and realised that what we would like we couldn’t afford. But still it’s good to dream. We all picked out what bedroom we’d like, which is a game we always play, George had a go at Billiards, and then found some dressing up clothes to try on. They were aimed for children a little younger, but George being George he wanted to have a go. 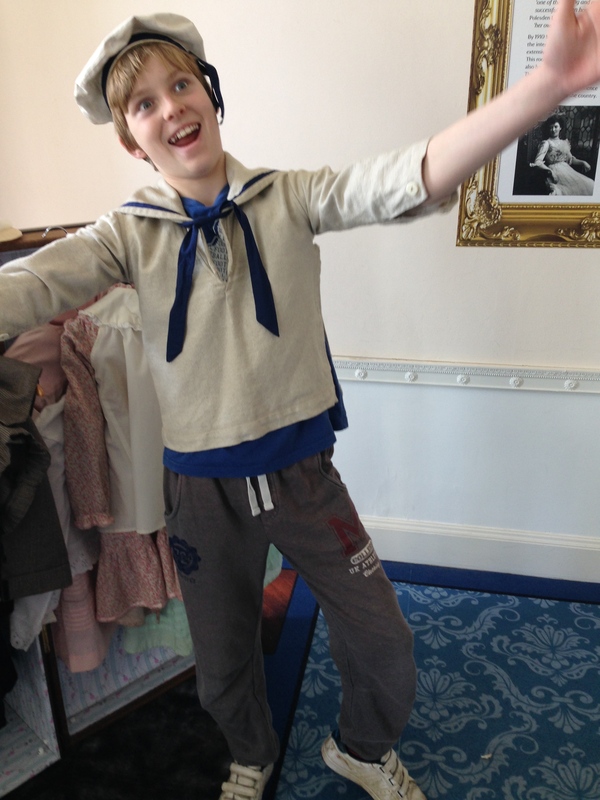 First of all he dressed up as a poor boy with a cap and waistcoat on and then a sailor. Looks more like the Stay Puffed Marshmallow Man from Ghostbusters. 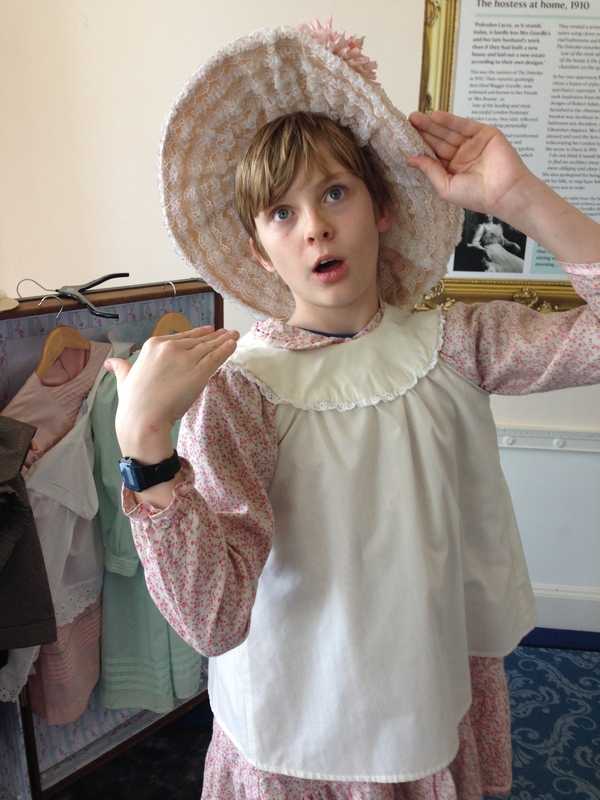 He then discovered that the girls clothes were more his size, so with no encouragement at all he put on a flowery and dress. The lady asked if he like acting, which he replied he did. And then she said that she’d never seen anything like this before. I offered to let him stay with her for the rest of the day and then she’d see some more unusual things that she’d never seen before, but she politely declined. Mrs Greville would be so proud!! After our lunch we then went and got an ice cream and sat in from of the house and again looked at the view. It was very busy with lots of families out enjoying the sunshine. A perfect way to end the Easter Holidays. This entry was posted in Uncategorized and tagged claire's allotment, Mrs Greville, National Trust, Polesden Lacey. Bookmark the permalink.